The only nurse aid training school in Hua Hin. We offer the Health care services for children and elderly. 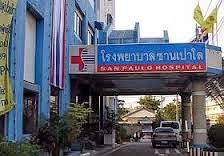 Bangkok hospital Hua Hin branch. Beauty treatment and skin care. Healing center in Hua Hin focusing on health enhancement, lifestyle and health education. We do provide lifestyle consultation, healing sessions, holistic activities, organic tea and natural silk skin care products. We specialize in professional facials for ladies and gentlemen. Prices from 250 baht per hour, packages consisting of several massage and reflexology techniques are available.